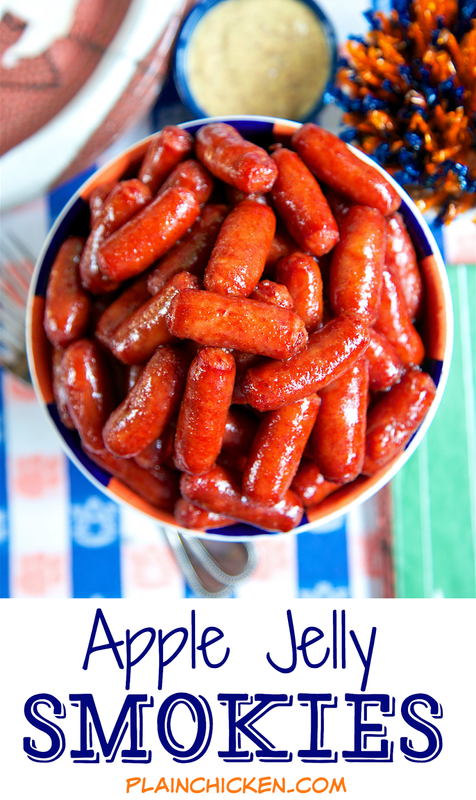 Apple Jelly Smokies - OMG! SO good! 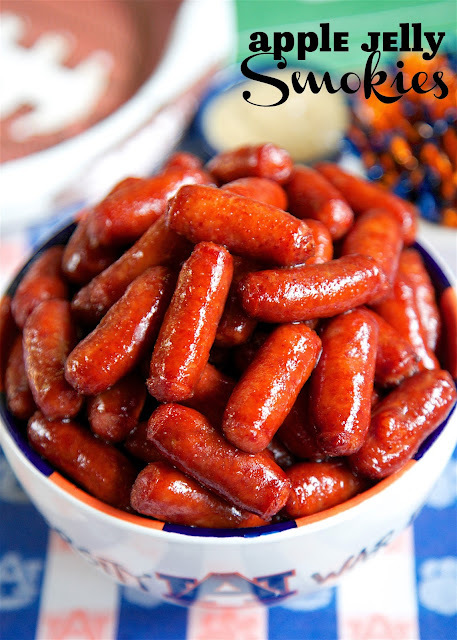 These are always a huge hit at parties! Only 3 ingredients! Can make on the stovetop or in the slow cooker. I always double the recipe - they don't last long! 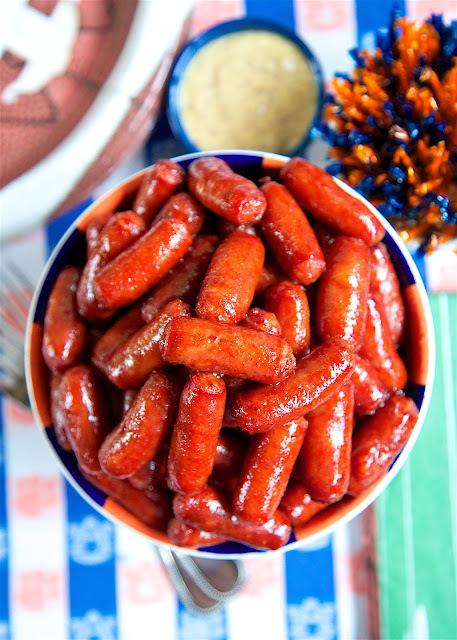 Little Smokies are one of my absolute favorite football foods. I could make a meal out of Pigs in a Blanket! I am always looking for new ways to prepare my favorite foods. I ran across this recipe in one of my cookbooks (Candlelight and Wisteria) and decided to give it a try. I was a bit worried about how they would taste, but they were crazy good! There are only three ingredients in this recipe. Little smokies, apple jelly and mustard. 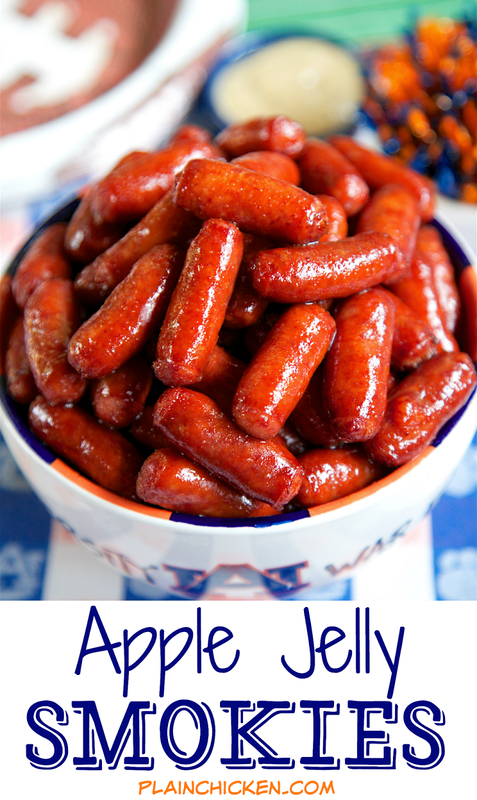 I wouldn't classify myself as a fan of mustard or apple jelly, but these weenies were crazy good! You can make these on the stovetop or in the slow cooker. I've made them both ways and either way is great. I usually double the recipe and there are never any leftovers! Give these a try at your upcoming Super Bowl party. I promise everyone will love them! Combine all ingredients in large saucepan. Cook on medium heat for 10 to 15 minutes, until weenies are warm. You can combine all ingredients in the slow cooker and cook on LOW for an hour. Thanks for this - we like little smokies but my son doesn't like barbeque sauce, so we usually cook them plain with sauces on the side. Maybe he'll like this version - we'll give it a try.